T.S. Elliot seemed to prophecy that “This is the way the world ends / Not with a bang but with a whimper”. Into the Forest is that whimpering world, where the apocalypse has come, but no one knows it quite yet. Two sisters find themselves trying to survive with dwindling resources in their decrepit family home. All the electricity has gone out, with little to no explanation, and with it internet, cell phone service, and society. Nell (Ellen Page) and Eva (Evan Rachel Wood) seem to take the loss of power in stride, in a film much more grounded and realistic than most apocalyptic narratives of its type. Obviously, the power loss could only be temporary. How could the whole nation simply go dark? All the girls want is to get back to their daily lives, as soon as possible. Nell has a test to study for. Eva has her last shot at a big dance audition. As the days without power mount, Nell studies and Eva dances. A metronome ticks steadily in the place of music, tic toc tic toc. A burnt out electric grid is merely the back drop for writer/director Patricia Rozema’s true study; sisterhood. Into the Forest deals with love, loss, tragedy, trauma, and depression in very real ways, and constantly brings the bond between sisters to the forefront of each emotional landscape. At the outset, Rozema compares the motions of bodies with the shape of the hills and mountains, intermingling shots of the two girls at their studies and the wild landscape that surrounds their home. Into the Forest is littered with beautifully staged shots. There is an ebb and flow of raw, emotional intensity that feels like a logical extension of the opening dance. There is grace even in the ugliest moments at the end of the world. The two sisters are opposites who grow to be two halves of a whole. Nell is short, brunette, and plucky as all hell. Eva is tall, blonde, and laser focused. Page delivers her best, most unguarded performance yet as Nell. Wood is an even match, with captivating stillness and intensity. Into the Forest is victim to its slow burn, making obvious its origins as a novel. A few things come too easily. There just happen to be field books and encyclopedias still lying around in print, in the future. Berry identifying never goes awry. Canning supplies are readily available. The girls are both over equipped and under, whichever suits the film’s purpose. Ultimately, the film suffers most heavily from its impulsive conclusion that seems too symbolic and not quite practical enough for a survivalist tale. 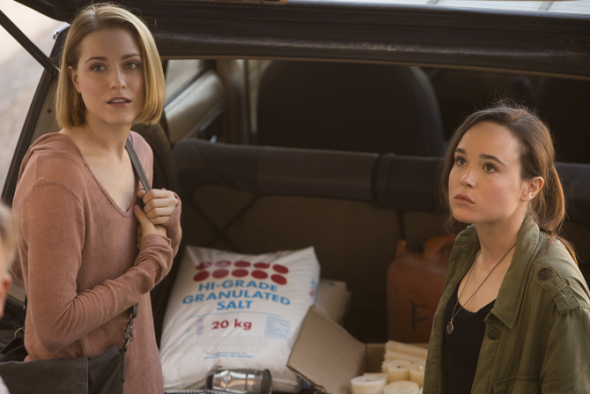 Into the Forest is a well-shot film with strong themes and stronger women. Despite the bizarre end, Rozema has managed to transcend many of the original text’s faults and found the true heart of the tale; sisterhood, humanity, and the constancy of Mother Nature.